At the AGZ (Atlas Gold Zone) prospect surface rock chip sampling has outlined an 800 by 500 m area hosting multiple gold-anomalous quartz-alunite alteration trends, with 55 of 473 rock chips assaying between 1.0 and 50.3 g/t gold. 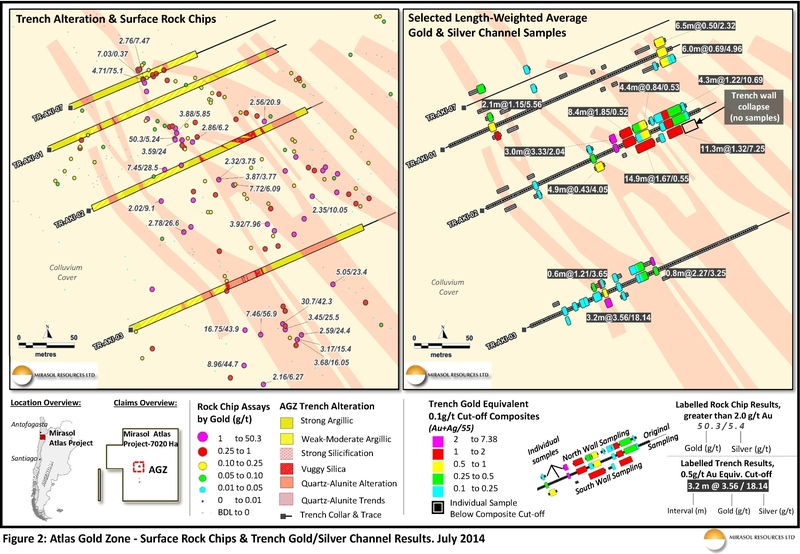 Highest individual channel samples from the re-sampled trenches include 1.2 m at 8.85 g/t Au and 45.8 g/t Ag, and 1.0 m at 5.63 g/t Au and 5.13 g/t Ag. 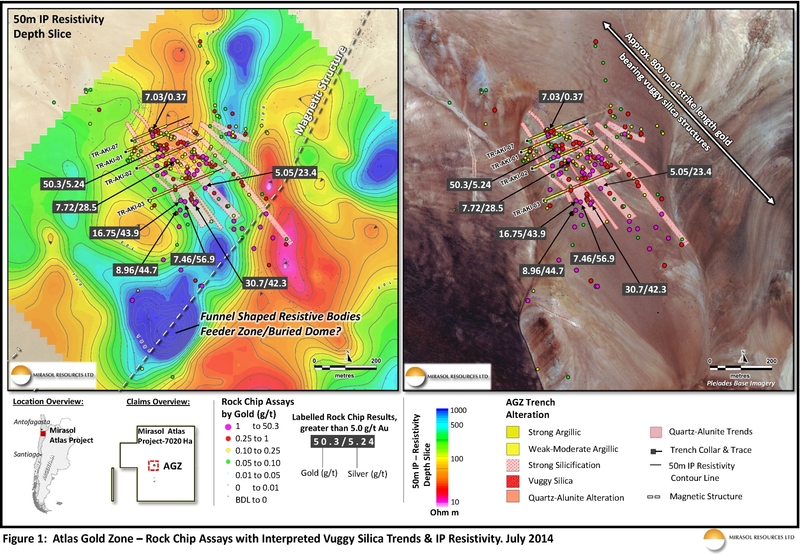 Mirasol Resources recently reported that it had outlined an 800 by 500 m zone of anomalous gold and silver mineralization in rock chip float and subcrop samples at its 100%-owned Atlas AGZ prospect (Figure 1; and see news release of July 18, 2014). Of the 473 rock chip samples collected here, 55 have assayed between 1.0 to 50.3 g/t Au. These higher-grade samples are interpreted to define a series of northwest-trending quartz-alunite alteration zones with vuggy silica and hydrothermal breccias, hosted by andesitic lava flows, or an andesitic flow dome. The gold – silver trends are spatially associated with a 1 km long, opened-ended highly resistive geophysical anomaly defined in Mirasol’s recent IP survey at Atlas. These resistive anomalies may represent hydrothermal feeder zones or buried flow domes. Anomalous rock chip samples with assays in the range 0.1 to 30.7 g/t Au and with Ag assays up to 56.9 g/t occur on the margin, or over the top, of the buried resistive anomalies potentially representing geochemical leakage from the covered geophysical features. Mirasol also recently completed a detailed re-mapping and channel re-sampling program (Figure 2) over the existing trenches at the AGZ prospect to better understand the mineralization in the trenches and its relationship to the Au and Ag-bearing quartz-alunite zones at surface. 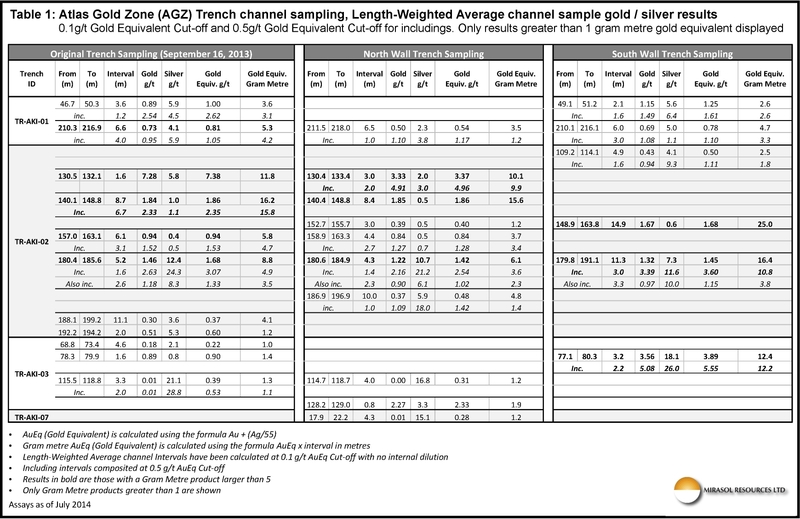 The best length-weighted average trench channel results (Table 1) from this season’s sampling include 11.3 m at 1.32 g/t Au and 7.3 g/t Ag, and 14.9 m at 1.67 g/t Au and 0.6 g/t Ag (at a 0.1 g/t Au equivalent cut-off). Higher-grade channel intervals (at a 0.5 g/t Au equivalent cut-off) include 2 m at 4.91 g/t Au and 3.0 g/t Ag, and 2.2 m at 5.08 g/t Au and 26.0 g/t Ag. 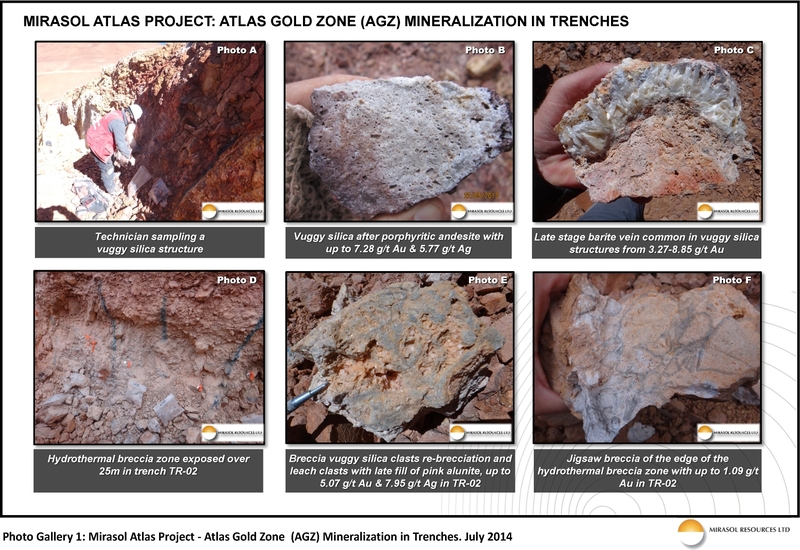 The gold – silver mineralization in the AGZ trenches correlates to a series of vuggy silica structures (Photo Gallery A, B, C) and alunite matrix hydrothermal breccias (Photo Gallery D, E, F) with quartz-alunite alteration halos. These structures and breccias are best developed over a 70 m section of Trench 2, with individual vuggy silica structures ranging up to 4 m wide, while the hydrothermal alunite matrix breccias are exposed for intervals of up to 23 m along the trench wall (true width unknown at this stage). Mineralized zones in the trenches show a strong correlation with the surface quartz-alunite trends. The higher-grade surface rock chip trends, including areas with rock chip assays up to 30.7 g/t Au and 42.3 g/t Ag identified this season have not yet been trenched. This presents an excellent opportunity to extend the mineralized zones. The presence of abundant primary hypogene alunite and vuggy silica alteration of the gold – silver host rock is consistent with a high-sulphidation epithermal character to the AGZ mineralization. This type of mineralization has produced both high-grade structurally-controlled and open-pit bulk mineable gold-silver mines elsewhere in the Miocene belt of Chile. All trench and surface rock chip samples at the AGZ are strongly oxidized with no preserved sulphide recorded. This suggests the potential for oxide-gold mineralization at the project. Mirasol’s geologists are processing results from surface sampling, re-mapping and channel re-sampling of the Atlas Silver Zone (ASZ) trenches. These results will be reported once complete. Mirasol’s management are very pleased with the exploration outcomes of the 2014 summer program and the Atlas project where three prospects; the AGZ, ASZ and Pampa zone have now been identified and new quality drill targets are beginning to emerge at the AGZ prospect. Exploration at the Atlas Project is supervised by Stephen C. Nano, who is the Qualified Person under NI 43-101 and Timothy Heenan, Exploration Manager. All technical information for the Company’s projects is obtained and reported under a formal quality assurance and quality control (QA/QC) program. All drill, rock chip and stream sediment samples are collected under the supervision of Company geologists in accordance with standard industry practice. Samples are dispatched via transport to an ISO 9001:2000-accredited laboratory in Chile for analysis. All drill, and rock chip samples are submitted to the Laboratory with independently sourced, accredited standards and blanks and where appropriate duplicate samples to facilitate monitoring of laboratory performance. Certified Results are examined by an independent qualified consultant to ensure laboratory performance meets required standards.